A group of 11 Nature Conservancy of Canada (NCC) staff and volunteers recently held a tree planting event at NCC’s Meeting Lake 03 property. Located 90 minutes northeast of Saskatoon, this property is part of the boreal transition. This means that the 477-acre (193-hectare) property is covered in a mixture of woodlands, wetlands and open grasslands. With such an array of different natural areas on a single property, Meeting Lake boasts a diverse range of plants and animals. Before NCC purchased Meeting Lake 03 in 2011, large sections of its forested regions were clearcut, disturbing the ecology in the region. 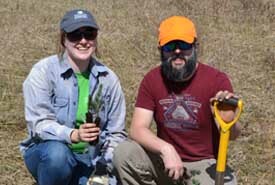 It has now become an annual tradition in NCC's Saskatchewan Region office to hold a tree planting event at Meeting Lake 03 and repair the damage done by the logging. Staff and volunteers were treated to a beautiful day, with no clouds or bugs in sight. The tree planting went surprisingly quickly with everyone working so hard. With over 300 white spruce, 70 paper birch and 30 red osier dogwoods to be planted, it was a big task for amateur planters. But after inspection, it seemed like all of the trees were properly planted — and in record time. The trees were donated by SaskPower’s Shand Greenhouse, which has been a long-time contributor to the annual event and makes the event possible. The newly planted trees help speed up the restoration process, but if the area was left alone, it would eventually re-grow in a manner similar to how it has been planted. NCC does the tree planting to lessen habitat loss for species that rely on the forests, and to counter the effects of invasive species. There were lots of smiles and, despite sore hands, everyone who attended the Meeting Lake tree planting event said that they had a wonderful time. For other upcoming events like this one, visit NCC’s Conservation Volunteers event page here.